Since 1976, the Mountain Association for Community Economic Development (MACED) has been partnering with people in Kentucky and Central Appalachia to create economic opportunity, strengthen democracy and support the sustainable use of natural resources. A big part of MACED’s work is investing in local business with financial support and expertise. They accomplish this by providing loans and technical assistance to individuals, businesses, and communities in eastern Kentucky and Central Appalachia. By providing these capacity building efforts, MACED helps enterprises stay sustainable in order to have a positive impact on the people and environment of their region. Only one person on the team had access to performance records. They needed a centralized system so everyone could access the information they needed, and eliminate their information silos. MACED’s lending and business advisory teams needed to be able to track clients as they moved through their loan origination and sales pipelines. They also needed a way to track client business advisory projects and see at a glance their status, staff and consultants assigned to each project, and hours worked on each project. A centralized database from which they could extract specific data in order to report on their programs’ impact could address this need. MACED now has a loan module that tracks clients through the loan process, from application all the way to closing. Their Technical Assistance module helps them track business advisory service projects, record hours, and upload reports. Then there are the special reports, which track program outcomes and impact metrics, information that is essential for reporting to stakeholders. Other special reports help monitor staff and consultants’ work and hours spent on projects. Much of this information is pulled into a weekly Pipeline Report that serves as a dashboard for all the loan and Technical Assistance projects that are currently in process. 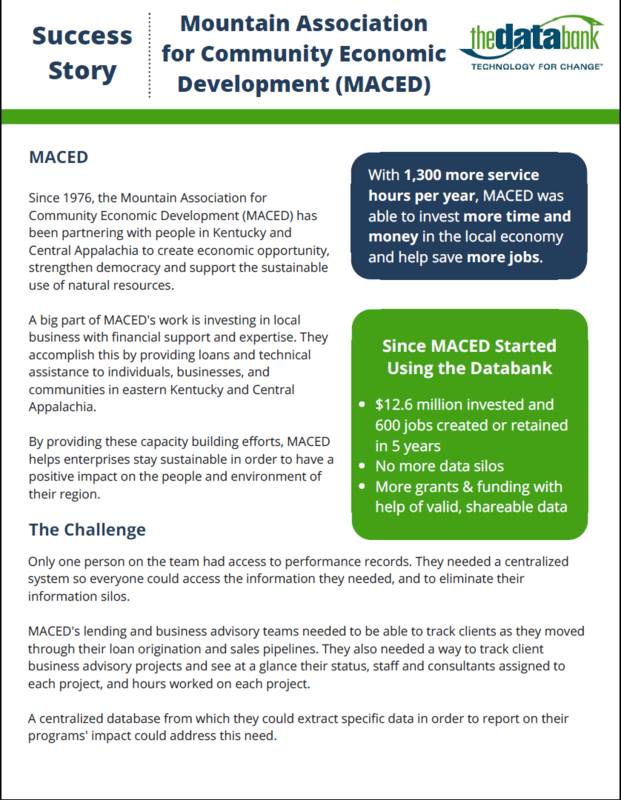 On average, 10 loans and 15 technical assistance projects are in process at a given time, so it’s important for MACED’s economic development team to be able to see a large amount of data in one place. The loans and technical assistance provided by MACED improve the local economy and encourage job creation. In five years, MACED supported the creation and retention of over 600 jobs and invested more than $12.6 million in growing enterprises. The technology they use now has increased MACED’s efficiency by streamlining their timekeeping and project monitoring processes. With the entire team using the technical assistance module as a detailed database, MACED has increased their reported technical assistance hours from 2,000 to 3,300 per year – a 65% increase in services. Even their data entry habits have shifted with the use of their new technology; attention to detail has become second nature to the team so their records are clean and accurate. Get the printable PDF and share it with your team! Click the image to download or click download now.